In Word, we can identify a word or phrase in a document automatically. This is very useful when we want to locate a word of interest in our text. To do this, we click on the Home tab in our toolbar. We will use the Editing area. Here, you will find the related options and functions. Open the Find and Replace function by clicking on either Find or Replace. 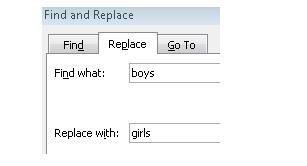 For example, we write the word "boys"
and if we want to replace the word "boys" for the word "girls"
And if we want to replace all the words "boys" for "girls", we click on Replace All.